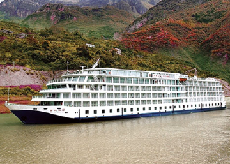 Ask us today about THE MOST AWARD-WINNING RIVER CRUISE LINE! Let us craft you the perfect cruise vacation! Cruise reviews reflect the opinions of travel editors and cruisers/ readers and may not represent those of our company. Pros: The size of the ship. Pros: The itinerary was well organized and everything went smoothly. Cons: Wanted to have a longer visitation to the school, need extra time to listen to a lesson by the teacher and time for questions. Pros: Fantastic excursions, hotel stays, food, tour guides and overall service. China- Beijing, Shanghai and other locations on the cruise. Pros: Well organized, good excursions, good food and casual. Cons: No down time and stops at Viking shops like the jade factory.